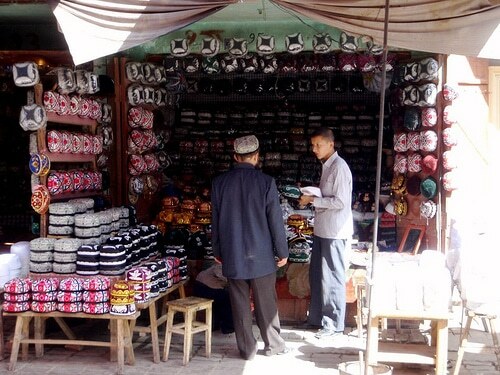 When you’re in Xinjiang you’re going to want to pick up a few souvenirs. You may see see a unique shop or stall that peaks your interest. 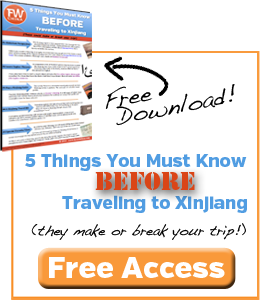 These souvenirs won’t be available online or outside of Xinjiang, so get what you want before you leave. Markets in Xinjiang try to sell tons of trinkets as being “Xinjiang”, but these are the only FarWestChina recommended things to grab. 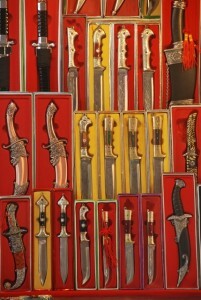 Description: Then Yengisar Knife is one of the most popular souvenirs from Xinjiang. 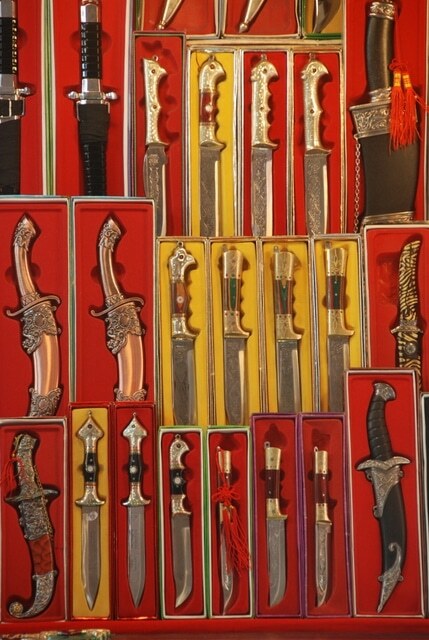 Handcrafted by the Uyghur people, these items can range from little pocket knives to gigantic swords. A single stall will usually carry between 100-500 different knives, so there are plenty of options. Keep an eye out for cheap work on the handle. History: This knife is named after the city in Xinjiang where they are supposed to have originated. Yengisar is a small city nearby Kashgar on the western tip of China and it has been producing these knives for over 400 years now. 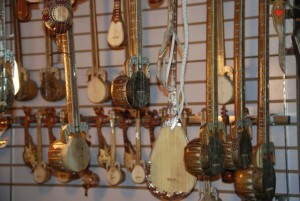 Description: There are quite a few different kinds of Uyghur instruments, but the most popular is the Rawap, a long stringed instrument that you can see in many sizes on the left. These wooden instruments can be either 3-stringed (ancient practice) or 5-stringed (modern practice) and usually have an animal skin covering the sound box. In addition to the Rawap, you can also find a Dutar (2-stringed lute), a dap (beautifully decorated drum) or a variety of other instruments. 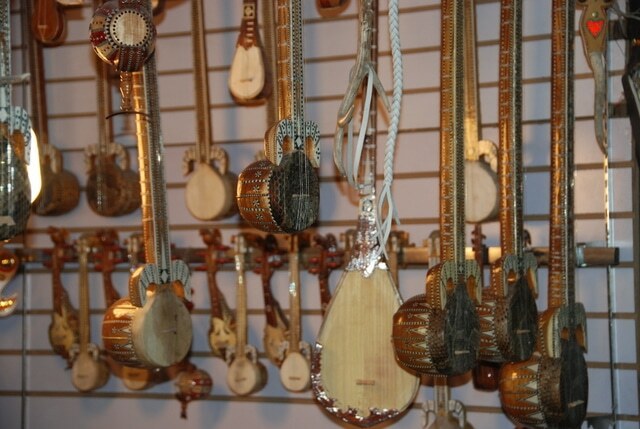 History: Each instrument has its own history that usually begins around the 14th century and centers around what is known as a “meshrep”, a traditional Uyghur musical celebration. Suggested Price: Varies greatly depending on quality and size. Description: Xinjiang is well known for its delicious nuts and fruits, and it’s amazing to see how many different color raisins there are! Open air stalls like the one you see to the left are great to pick up snacks for a long trip, while grocery stores offer great packaged goods that can make it across international borders. Make sure you don’t buy at a transportation hub (airport, train station, etc.) where the prices are inflated 200%. To purchase, just point at the desired snack and tell them how many kilograms. 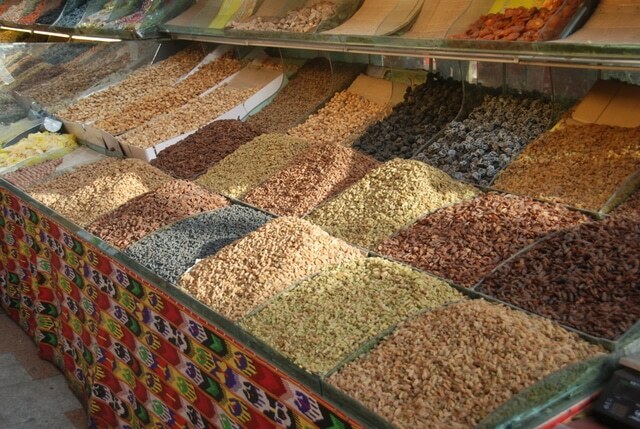 Don’t be afraid to just ask for a little bit of each…the vendors are used to that from tourist. Description: Wherever you travel in Xinjiang you are bound to run into a ton of Uyghur men wearing a 4-pointed hat called a “dopa” or “doppa”. They are usually brightly colored and embroidered with beautiful beads. They have come to be known as a symbol of the Uyghur people and are very easy and cheap to get a hold of. The best part is that, because of their design, these hats collapse for easy transport. These hats don’t signify Islam, although many people who wear them are Muslim.